Following are links to a variety of Norton heavy twin cam profiles. They represent many, many, hours of data taking of a sampling of Norton factory, Axtell, Dunstall, Harmon & Collins, Johnson, Megacycle, Norris, Norvil, Pete Williams(Hemmings) and Web. The newer profiles have been taken on the new cam measuring test fixture I designed and fabricated. Measurements are to .0001" resolution. The main limitation is my seeing and then setting the degree wheel by hand. This degree of resolution shows the variations within the base circle of some cams and brings into question the capability to accurately set valve lash. All the profile data is raw cam lift data measured directly off the cam with a flat or 3"radiused brass shoe, and no rocker arm ratio or clearances are taken into account. Unfortunately during my early profiling, I did not pay as much attention to detail in the opening and closing ramp areas. On those, only the lift and overlap are useful. The later ones show more detail. I will be going back over the cams I still have access to, and retake the profile data with the extra detail needed. As of this date many are completed, but some cams I do not have access to, and are not likely to be reaccomplished. NHT cams are either on twin chain (cam/magneto) core or later commando single cam drive chain version.While they have some dimensional similarities, they are not interchangeable. cam100.gif D12-790 The original 29hp dominator model 7 cam, very mild. It is installed a little more advanced than shown on the graph. This engine comes standard with radiused lifters. cam140.gif 21225 This is from a standard model 88. Significantly hotter than the model 7 cam. cam120.gif 063536 The famous or "infamous" 2S combat cam. 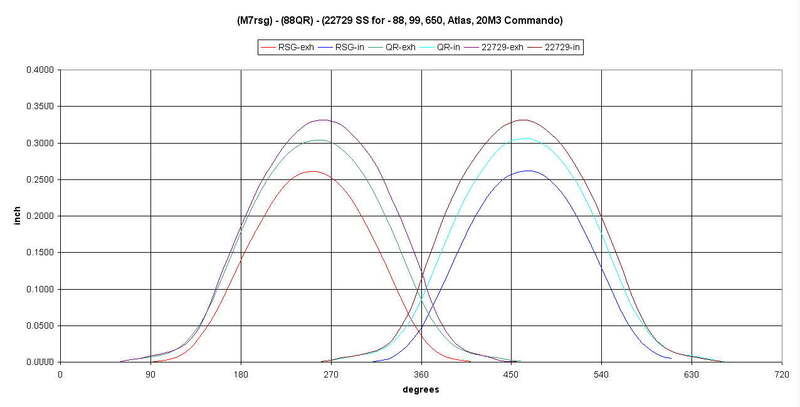 Note*** this is MARKED "SS" on the camshaft, but it is not the 650SS (1S) grind. cam120a.gif 2S Combat grind with 3" radius lifters. cam210.gif PD04ZC mild cam not much hotter that a stock cam. A bit more lift and duration, very little extra overlap. Used in my Dunstall Atlas on a twin chain core and This is the same Dunstall grind later supplied for commando's on a single chain core. cam220.gif PD R2 B540 WFC, This cam was out of a grenaded 810 Dunstall kit, probably the claimed 75HP version when ALL the mods have been done, including the ported reangled big valve intake head.. The cam I sampled was prepped for needle roller bearings and pressure oil feed to the cam lobes. Similar grind to the Norton Combat 2S cam. cam440.gif 4S camshaft. Also very close to 2S Combat when the extra lash clearance is taken into account! cam470.gif 7S camshaft. Getting warm yet?. Caution-Megacycle uses a 1/4-28 bolt to retain ignition AA unit or ignition rotor. vs 1/4-26bsf on english commando 20M3S+ cams. cam630.gif 56-0NR This would be the cam I would recommend as the slight boost over a regular norton 06-1084 1S cam without the "hot rod" syndrome. cam2123.gif PD03-105º, PD04ZC-102.3º, virtually same profile with different lobe centers. cam356392.gif 5S, NR, NT360 virtual clones....Who made who? cam120rw.gif 2S on a domi core. This shows a lot of detail on the exhaust ramp and a second set of ramp profiles super imposed on the original profile. This second set of ramps it the "after" of the grinding process that I did to the cam to make it suitable for my purposes. 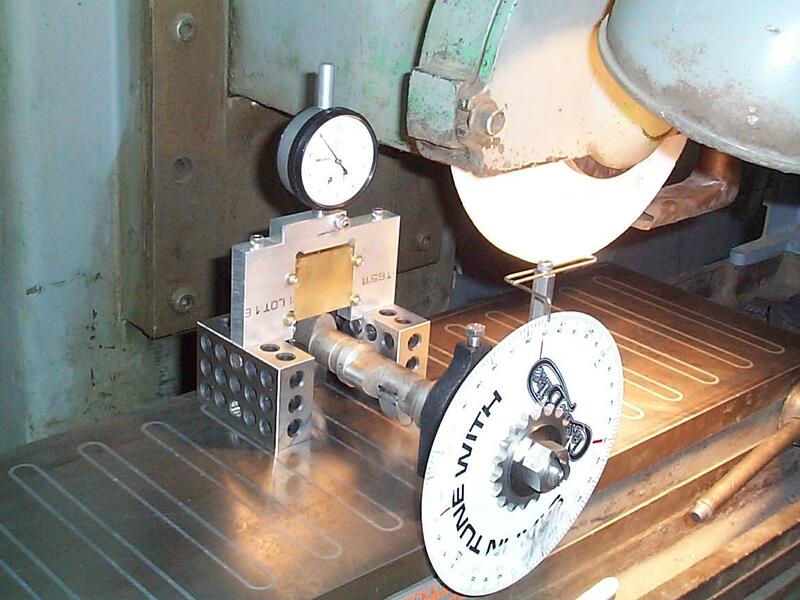 Pix of cam measurement and grinding process Norvil sourced, but they claim Norton Andover are supplying them. It has been verified by two others that a 4S (domi and commando core ) and the 2S (commando core) are also afflicted with this design ramps. Care should be used to insure enough valve lash on these cams.